President Ken Gormley recently announced the promotion and tenure of several faculty members throughout the university, including School of Pharmacy faculty members Dr. Wilson Meng, Dr. Branden Nemecek and Dr. David Zimmerman. 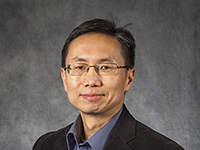 Dr. Meng earned a promotion to full professor. He teaches in the pharmaceutics department in the Graduate School of Pharmaceutical Sciences and joined the School of Pharmacy in 2001. He spent time as a visiting scientist at the Molecular Biosensor and Imaging Center at Carnegie Mellon University and has served as a grant reviewer for the National Institutes of Health, The Wellcome Trust (UK), and the National Science Foundation. Currently, Dr. Meng is an assistant editor for the Journal of Pharmaceutical Innovation (Springer) and previously served as a guest editor for Clinical Immunology (Elsevier). He has received an Apple Polishing Award for Excellence in Faculty Performance and a School of Pharmacy Faculty Award and was inducted into the University Research Hall of Fame in 2015. Drs. Nemecek and Zimmerman both were granted tenure and promoted to associate professors. 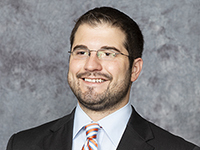 Dr. Nemecek joined the School of Pharmacy in 2013 and teaches courses in internal medicine and acute care and maintains a practice site at UPMC Mercy. 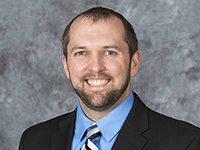 He currently serves on the ASHP New Practitioners Forum Residency Advancement advisory group and has previously served on the New Practitioners Forum Professional Practice advisory group. Dr. Zimmerman also maintains a practice site at UPMC Mercy as an emergnecy medicine clinical pharmacist and teaches courses in emergency medicine at the School of Pharmacy. His research interests include pain management, pharmacokinetics, implementation of pharmacy services and drug dosing in obesity.